Johnson & Johnson has filed for approval of a new indication for its prostate cancer drug Zytiga in the US and EU, which could allow it to be used earlier on in the course of the disease. 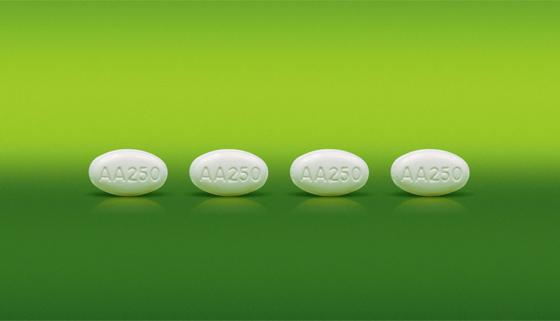 The company's Janssen subsidiary has filed for approval of Zytiga (abiraterone) alongside prednisone in patients with metastatic castration-resistant prostate cancer (mCRPC) who are asymptomatic or mildly symptomatic after failure of androgen deprivation therapy and before chemotherapy. Zytiga was approved in the US and EU last year as a treatment for mCRPC cases who had previously been treated with docetaxel-based chemotherapy. The product has been gaining rapid acceptance among medical oncologists, with sales running at $200m-plus a quarter and analysts predicting potential peak sales in excess of $1bn a year. The filing is based on the results of the phase III COU-AA-302 trial, which found that in 1,088 asymptomatic or mildly symptomatic men with mCRPC who had not received chemotherapy Zytiga plus prednisone demonstrated a survival improvement of 3.9 months compared with placebo plus prednisone. Charles Ryan, a medical oncologist at the University of California San Francisco said during the American Society of Clinical Oncology (ASCO) meeting earlier this year that the phase III trial clearly supports greater use of abiraterone, given that 64 per cent of patients achieved substantial declines in prostate-specific antigen (PSA) levels with the drug. Abiraterone treatment was generally well-tolerated, and the results also indicate that quality-of-life can be maintained in these patients, extending the period in which patients were free of pain, required chemotherapy or showed a decline in daily performance levels, said Ryan. The expanded indication would give Zytiga a leg-up as it competes with the likes of Sanofi's Jevtana (cabazitaxel), which had sales of around $50m in the first quarter of 2012 and is currently indicated for second- and third-line use in mCRPC. Zytiga is also being tested in a phase III trial as a first-line treatment for mCRPC, and in this setting its main competition will be Dendreon's Provenge and Active Biotech/Ipsen's tasquinimod, according to Decision Resources.